Bet Mar Liquid Hobby equipment kits come with your choice of any of our low gravity extract recipe kits, which are made fresh daily. You can upgrade our low gravity for a high gravity recipe kit for only $15.00 more if you desire. 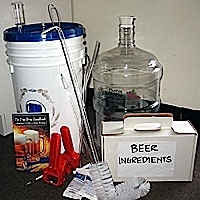 All of our extract recipe kits come with the proper malts, grains, hops, yeast, priming sugar, bottle caps, and any additional ingredients pertaining to that particular extract kit. Additional Items you may want to purchase are: hop balls; grain socks; stainless steel brew kettle.